The Queen’s Park Sports of 1925 had been very successful with many of the top athletes participating. The meeting of 1926 also had several top men in action across the board. Held on 5th June in brilliant sunshine and before a crowd of approximately 7000 spectators, Tom Riddell was the top performer – or the ‘feature of the meeting’ as the Herald report had it. He finished second in the half-mile and defeated CB Mein (above)in the first stage of the inter-city relay race. This played no small part in Glasgow winning the event for the first time. The Two Miles Harriers Race was won by Walter Calderwood of Maryhill Harriers with Frank Stevenson of Motherwell second, Charlie Freshwater and Dunky Wright of Caledonia AC third and fourth. Caledonia AC was set up to be a ‘club of champions’ with W Sans Unkles and Dunky Wright the main protagonists. It only lasted for the one season – Charlie Freshwater had signed up from Clydesdale Harriers and Wright had come from Clydesdale by way of Shettleston before going on to jon Maryhill when the Caledonia adventure came to naught. The club won the team race from Maryhill Harriers. Celtic beat Rangers in the final of the five-a-sides by 2 goals to none. In the open events, Walter Lawn won the 100 yards and was third in the 220 yards – Lawn went on to have a printing business that provided numbers for the SAAA championships for many years as well as for most open meetings of any size. The weather and ground conditions which prevailed at the Queen’s Park club’s annual sports on Saturday afternoon were not of the kind conducive to to exceptional performances, yet the sport throughout was interesting and the times recorded were distinctly good. The outstanding event at the meeting, both in point of competition and on merit, was the invitation quarter-mile, and in winning from two yards in 51 4-5th sec, RB Hoole gave a glimpse of better form than he has hitherto shown in the West. He had to fight all the way for his victory against RT Hollinger of Plebeian Harriers and JC Hamilton the Glasgow University champion, and the manner in which he secured victory on the tape from the first named, was a tribute to his pace, stamina and judgment. JD Hope, the champion, was not suited by the conditions. He is of a build better suited to calm than storm, and he was never concerned with the ultimate issue. Hoole and Hope were down to meet later in the afternoon in the inter-city relay race, but the withdrawal of HC Maingay from the Edinburgh team robbed this promised trial of skill on level terms in the quarter-mile section, and also that of RD Allison and R McLean in the furlong, of much of their interest, as CB Mein, who sportingly stepped to the vacancy was obviously not fit and accordingly not able to hold RB McIntyre who ran the half-mile for Glasgow. The ground lost there was never regained by Edinburgh and we will have to wait untl the championships to have the merits of these opponents accurately tested. Enough was seen, however, to suggest that both furlong and quarter-mile championships will prove exceedingly interesting. As is usual, the student element was strongly represented in the prize list. 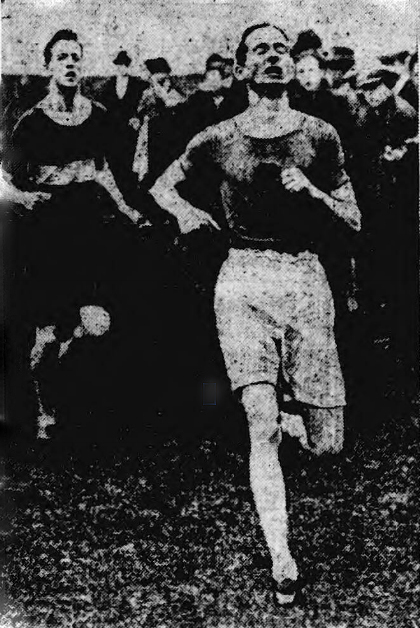 In addition to Hoole, AF Clarke and GPS Macpherson occupied first and second places in the hurdles; R Patience of Glasgow won the Mile with something in hand, and A Tindal, also a Gilmorehill student, took second place in the open hundred. Tindal’s achievement in the hundred was somewhat unique, as he has hitherto been regarded as a distance man, and not only did he win the Mile at his University competition, but he took part in the SAAA 10 mile championhip in mid-April. Patience, a strongly built lad, was suited by the conditions in the Mile, but apart from that it was apparent that the handicapper took too lenient a view of the ability which several good judges are convinced he possessed. There was no meeting reported for 1928 but the event was only resting and it was back on the usual Saturday in 1929. On 1st June 1929, J Suttie Smith from Dundee wanted to attempt a new Scottish record: he was a top class internationalist on the track and over the country with several national titles to his credit and Queen’s Park regulars were keen to see him in action. “Chief interest in the meeting of Queen’s Park at Hampden lay in the attempt made by J Suttie Smith upon the existing Scottish native record for two miles. A special handicap had been framed for the occasion, and had the champion been able to head WJ Gunn , who ran off 85 yards, he might have been able to accomplish it, the Plebeian Harrier’s winning time being 9 min 31 1-5th sec. As it was Smith failed to do this, his time for the distance being 2 3-5th sec seconds worse than McLean’s existing figures of 9 min 31 sec. Smith did not appear to be moving too freely in the first three laps, but ran well in the closing stages. The times in the open races were fast, and it appears now that to win an open sprint even-time is necessary, judging by what happened at the Maryhill meeting and also at Hampden. Two juniors of last season figured successfully in these events. AD Turner of Maryhill Harriers who had almost a monopoly in his class last year, made a bright debut as a senior, as he ran second in the 100 yards, and won the furlong in 22 4-5th sec, while R Davie of Springburn Harriers, in his first public essay over the distance captured the half-mile in 1 min 58 3-5th sec. Both will win further races. There were ten track races plus an obstacle race, a high jump and a five-a-side competition won by Partick Thistle from Rangers by two goals to one afterextra time. Because of the very large numbers, the mile was divided into two races – the first class mile for the best runners (ie those with low handicaps) entered, and the second class mile for those with higher handicaps.